One of the most recognisable winter deep-sky objects is the famed Horsehead Nebula, in Orion. Also known as Barnard 33 (B33), the nebula is very difficult to see in telescopes even under dark sky conditions. The Horsehead is situated just south of Alnitak, the easternmost star in Orion’s belt, and is silhouetted against a strand of bright nebulosity catalogued as IC434. Also near Alnitak is NGC2024, which is another silhouette sometimes called the Christmas Tree Nebula. Of the nebulas shown in the photo above, NGC2024 is the easiest to see in a scope. 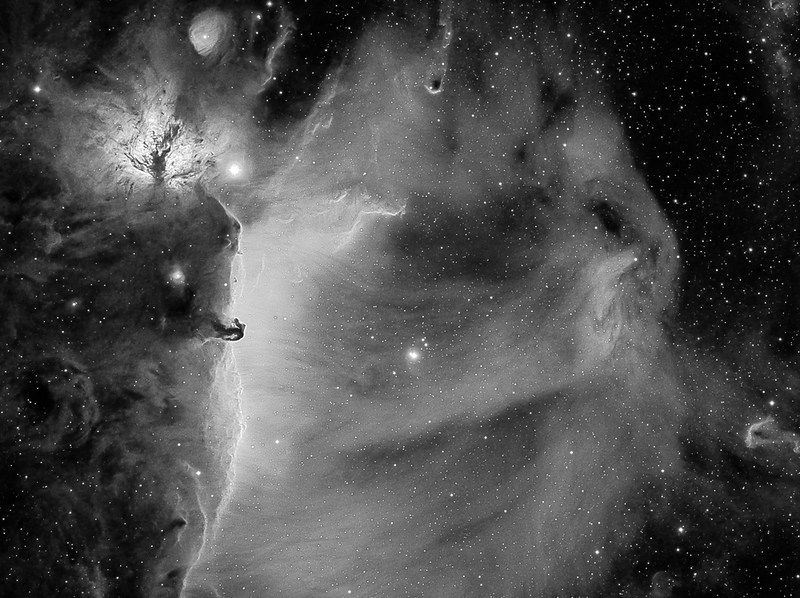 Grzegorz Gurdak made this monochrome image of the Horsehead and its surroundings from his Mississauga, Ontario, backyard where he accumulated at total of 7½ hours of exposure data over two nights with a William Optics WO Star 71 II 71mm f/4.9 apochromatic refractor telescope, ZWO ASI1600MM Pro monochromatic imaging camera and a Astrodon 3 nm H-alpha narrowband filter. This is unreal Grzegorz! Congratulations!